A new patented technology from IMGR Group: BLUESPIDER. 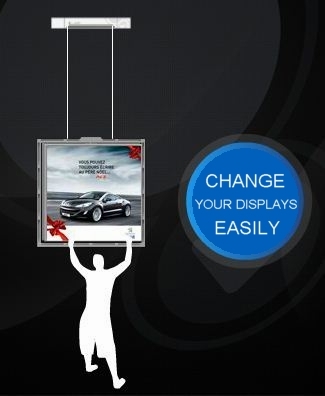 Have you ever wondered how to change that hanging displays faster and more safely? BLUESPIDER is a series of automated display hangers that allow you to change your display from the floor level without the need for a ladder or a lifting platform. Ask your posters or banners to quickly come down to you thanks to our clever remote control and change all your displays in record time. With our easy to use remote control you can also program your BLUESPIDER to continuously move your display up and down to the desired height. You can even make them swivel at the touch of a button. This is a real little revolution in visual communication. Your displays will never go unnoticed! To find out more about our BLUESPIDER automatic displays please visit www.bluespider.fr (sorry, only in French for now). BLUESPIDER automated display hangers allow you to change your posters and banners in record time without the need for a ladder or a lift. Change all your posters and banners within minutes with BLUESPIDER and make them move rather than keeping still on your ceiling. Your displays will get noticed!